Simicur Wound Spray is a natural clear disinfectant spray on the base of Aloe Vera, Symphytum, Ledum, witch hazel and calendula. By the anti-inflammatory, hemostatic and wound-healing effect, the wound spray is used in deep puncture wounds, wire wounds, abrasions and surgical wounds. 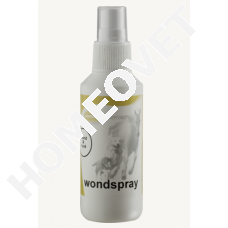 Through its disinfecting effect the spray can also be applied to fungal infections, cracked heels and mud fever. SIMICUR wound spray is applied to open wounds, skin irritations, fungal infections and cracked heels. Wound spray may be applied several times a day to the skin, by spraying a thin layer.